Home » What is Avast Passwords – All you need to know about. Avast Passwords is normally the embedded tool in avast antivirus. This tool simply helps out in managing and saving the secure and sensitive information on your computer. It keeps all the secrets and the sensitive information saved to one place. With the use of Avast Password manager, you can fill the web forms and access all sensitive information quickly. However, all the internet browsers are equipped with one or another password manager, these password managers help in saving the passwords and the identity. Still, they are not so secure that they can keep your sensitive information safe from hackers attack. Switching to avast password manager will definitely serve your purpose in this. Why is Avast Passwords more secure? How to upgrade to the paid version of Avast Passwords? How to customize avast password manager settings? Can I use Avast Passwords in all devices? How to sync avast password to another device? helps you in creating new passwords. make sure that new passwords created contain both alphabets and characters. Import your passwords from your internet browser. avast password generator, is also a nice and useful tool, as it helps you in creating secure passwords. It is said that Avast Passwords is way safer than your default browser password manager. Well stating the reason behind, then it is just because of the reason that when you store your password in the browser, these passwords are basically stored in the device only. Thus they are more vulnerable to the attacks and the phishing. Thus your password information can easily be leaked. Talking of Avast password managers, and considering is avast passwords safe, then avast saves your password with more secure encryption. All the passwords saved by avast password manager and encrypted thus the can be decoded only by the particular id they have been stored upon. Want to use Avast Password manager in your pc, well that’s not a task now, as it is supportable in MAC, Windows 7, 8, 8.1 and Windows 10 too. Still, you can check below whether your system falls in a particular category or not. Now you can also use the avast password manager from your mobile devices too. and iOS (8 or higher). Well talking of the avast password support, then Avast password is currently able to run in google chrome password manager, Mozilla Firefox, along with the pre-embedded in Avast Secure browser and Avast Safezone Browser. However, Avast password manager extensions are not at valid in the Microsoft edge or Internet Explorer. You can download and install Avast Password manager for free. 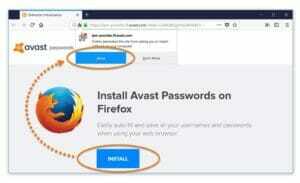 If you are using Mozilla or Chrome browser, then you can get the free avast password manager extension installed into your browser extensions. 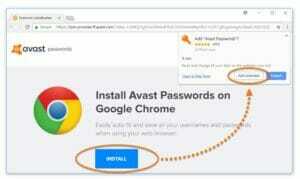 Avast passwords chrome extension can be added via google store or official avast website. Avast password extension is absolutely free to use. You can buy the premium version depending upo your needs. You also get the free Avast Password manager installed in the Avast Secure browser and avast safe zone browser. There is also another way by which you can download any version of avast antivirus (after avast 2015). When you start installing your antivirus, then tasks you for installing the avast browser and password manager too. Make sure you choose the password manager installation also. The basic Avast Passwords features are available with all editions of Avast Antivirus. For additional premium features, you can upgrade to Avast Ultimate or the paid version of Avast Passwords. Avast sign in is however required in order to get started with avast passwords. If you are using the avast antivirus as a source from avast password manager, then if your avast antivirus is activated with avast activation codes, then you will get the paid version for avast passwords. To upgrade to the paid version of Avast Passwords, open the Avast user interface and go to Protection ▸ Passwords. From the Passwords screen, click the Password Guardian tab, then select Buy Now. Avast Passwords is currently available for devices running Windows, macOS, Android, and iOS. For more information about Avast Passwords for mobile devices. You can sync passwords for all supported devices connected to the same Avast Account. Open the Avast user interface and select Privacy Passwords. If you haven’t already created a Master Password, you will be prompted to do this before continuing. Rest in case of any more problems please comment us or you can also login to www.avast.com login, and seek help regarding any avast related problems for free.